There are many ways to use your Fujifilm instax camera—taking pictures with friends, at concerts and famous monuments, and of course, lots of selfies! But sometimes the challenge is to come up with new ways to be creative. No worries, because we can help solve your photography block and explore the simple and ingenious new side to instax. Take ordinary objects around you and bring them to life through your lens. After your photo shoot, use your brilliant and ordinary object photos to make a collage (see above) or arrange each picture on your wall into a shape that will make the room simply dazzling. Here are five ways you can get creative photographing even the most simple, everyday objects. Consider all the possibilities that come from taking pictures of common objects. The greatness behind thinking outside the box is that it costs nothing more than time and experimentation. Go beyond your boundaries; find creative, colourful objects to shoot, like street signs, vases, plants, or textured walls. The goal is to challenge yourself to lead the viewer to see the ordinary object in the picture as something unique. 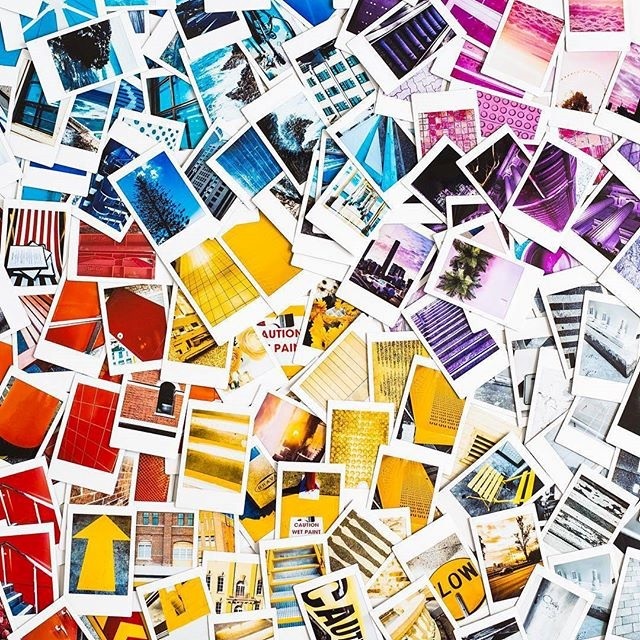 An endless number of objects around you can be transformed into instant photo magic. Find beauty in the ordinary; test out different angles for capturing the best shot. There’s no rush—set up your objects the way you want them to look. Frame the picture to be proportionate and balanced for a larger artistic impact. When choosing an object, it must stand out. Whether the object is your favourite colour, curvy shaped, matches the rug on the floor where you place your instax photos, or simply reminds you of a special time; make it enchanting. Remove background distractions and get closer to your object using the “in-camera cropping” technique. You have the power to make the photo worth 1,000 words. Go through a snap-happy frenzy and take a series of photos of the same object in different settings or lighting to ensure you get the perfect portrait. Go wild with your photos and take something that you can be proud of! The light setting you use on your instax will help enhance the feel of your photo. Make sure the instax camera you are using is switched to the recommended light setting. Soft lighting will help bring a muted finish and enhances the textures of the featured object. Natural lighting around your object can further enhance the mood of your photos depending on the time of day you’re shooting. Try out these techniques to see what goes best with your artistic side. Shooting common objects with your instax camera is one of the simplest and most enjoyable forms of photography. Follow your inspiration and let it lead you into bringing spirit to the ordinary—brilliant pieces that you will be honored to call your own work of art. Pair your instax with the Share SP-1 printer. Download our free app today and get the instax Share SP-1 smartphone printer at a retailer near you.